Great things happen when people discard their egos and return to their roots. A mob called Barkly Regional Arts based in Tennant Creek has now completed two projects taking well-known Aboriginal pop musicians - familar through the cities via the Black Arm Band – back to their tribal roots to make music. I haven't come across Warren H Williams' encounter with the Warumungu Songmen, but I have just been wallowing in Shelley Morris's parallel coming together with her 'Stolen' grandmother's people around Borroloola at the SE corner of the Gulf of Carpentaria. So many strands are played out here. Shellie has clearly gained enormously from making the acquaintance of her ancestral Yanyua language – learning enough to write songs in it to pass muster with the group of women elders who've come together as the Borroloola Songwomen. Sadly, they form the majority of fluent Yanyuwa speakers left in the world. No idea what the situation is with the related Marra, Garrwa and Gudanji languages, but they also pop up on the records. 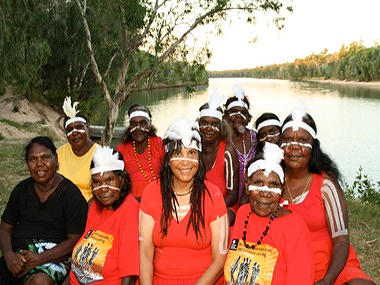 Another feature is that Shelley's personal fans are also going to have the chance to listen to the Borroloola women singing their own music and will perhaps discover where it fits into traditional life. For one of the pair of discs – and I suggest you listen to it first – is all their's. Songs of seasonality, food resources (including, I'm afraid, the nesting sea turtle and the red-wing parrot! ), marital discord and the foundation myths of their tribes are on offer; some have been inherited, some dreamed (like Rover Thomas's famous Krill Krill Ceremony), others simply composed. And the Western coast of the Gulf of Carpentaria has always been known as the starting-point for Arnhemland's stories. Interestingly, given that this is an all-women's effort, they invariably involve the arrival of women/Earth Mothers from the East – the Djang'kawu Sisters and the Wagilag Sisters, for instance, who are well-known in art. Here we're offered Garrwa legends of the A-Marrabarna mermaid spirits. And there's a hint of their involvement in the Kunabibi/Kunapipi Ceremony. These secret-sacred events are a contentious subject – so no further information is offered on the record-sleeve. But it's worth noting that anthropologists see this as the male justification for the end of the Matriarchy that invariably brought order to the world's earliest social groupings. Arnhemland's versions seem to require a serpent to swallow the founding Mothers and regurgitate them as men – now responsible for ceremony. Prof. Berndt, in his study of Kunapipi, associates the emergence of the men from the groaning serpent/womb as accompanied by bull-roarers. So perhaps the recording company was playing safe – but wrong – when using yidaki/didgeridu on these songs. The Voice on this disc is Elizabeth Lansen singing a Gudanji version of pre-Patriarchal events – full of miraculous transformations of trees and windmills into young Munga-munga girls, who dance and travel on, forming and naming the country. Shelley doesn't pick up on this material for her songs – most of which weave the old women's chants into her music. With the title track, Li-Anthawrriyarra (Saltwater People's Song) it works a treat. This is both moving and musically effective as it builds to an anthemic peak with the Gondwana Indigenous Children's Choir in full voice. On other tracks, there's less empathy with the old women, giving them electronic beats and 'atmospherics'. Shelley's own compositions are hailed as having "the same emotional connective qualities as that of Gurrumul". And I did pick up on some of the Yolngu man's softer side. Two questions remain – has anyone ever analysed why almost all Aboriginal traditional music uses a descending scale with all its depressed connotations? And why, when projects like this (and the Warramunga one) can find such riches in Australia's remote North does a festival like Womadelaide trawl the rest of the world for its featured acts? The 2-disc set is released by ABC/Universal and was principally suppported by the Commonwealth Government's Maintenance of Indigenous Languages program.